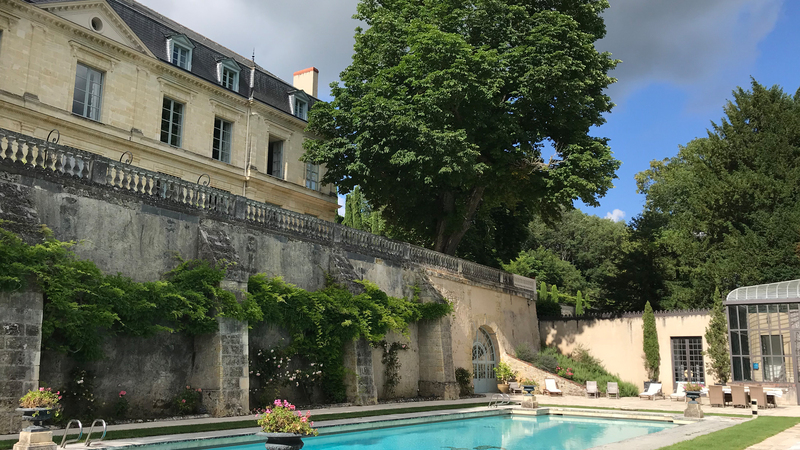 Check in at Le Domaine des Bidaudières, near the little town of Vouvray, just 10 km east of Tours, and you’ll be in for a supremely pleasant surprise. This gracious, entirely renovated guesthouse, set in a former 18th century wine-growing estate, has tons of charm, along with a splendid heated swimming pool overlooking its equally splendid 15-hectare terraced park. the adorable gardener’s house with its own private garden, the cosy two-room gatehouse, or the comfy ‘troglodyte’ apartment carved directly into the rock. Guests are unanimous in their praise, giving Le Domaine des Bidaudières excellent reviews and a top approval rating on 7 major travel portals: ‘very quiet and serene; marvellous surroundings, gracious and welcoming hosts; great breakfast and fabulous coffee!’ It seems you simply can’t go wrong. Check out the video and you’ll see why! No vineyards in sight? You may not be able to see them, but there they are all right, proudly perched on a hillside just behind the property. So it’s a perfect place to stop if you want to visit some of the region’s famous wineries. The Château Gaudrelle, for example, a 20-hectare vineyard nearby, owned by the same family since 1931. The estate’s master winemakers will gladly share the secrets of their work and the techniques they use to grow, harvest and process the ‘chenin blanc’ grapes that they magically turn into their fine dry, semi-dry, sweet and sparkling AOC Vouvray wines. Also close by, Les Grandes Caves Saint-Roch in Rochecorbon, a specialist in ‘fines bulles’, whose owners use strictly traditional methods to produce their award-winning Vouvray, Touraine and Crémant de Loire sparkling wines. It’s well worth a visit, as you’ll get to see the vast labyrinth of underground galleries, the largest troglodyte cellars in the region, where the wines are stored to age. The Domaine des Bidaudières is strategically located in the heart of the Loire Valley, between Tours and Amboise, with its galaxy of neighbouring chateaux, so you won’t be at a loss for things to do and see. That is, once you’ve finished sampling all those fantastic AOC Touraine wines!